This case study will focus on the current water issues affecting the lives of millions of South Africans. Climate change, government policy and carrying capacity are all drivers of water shortage problems plaguing the country. South Africa on the whole will be examined while focusing on the KwaZulu-Natal region where the city of Durban is located as well as the Inanda Dam where the region receives the majority of its water supply. In light of decreasing water supply due to increase temperature and decrease rainfall along with population increase, the South Africa government enacted the National Water Act in 1998. Although the National Water Act was passed as a water conservation effort, millions of South Africans are no longer able to pay for the amount of water they need for daily life. The implications of this policy have set the stage in South Africa for a potentially violent conflict in the future. 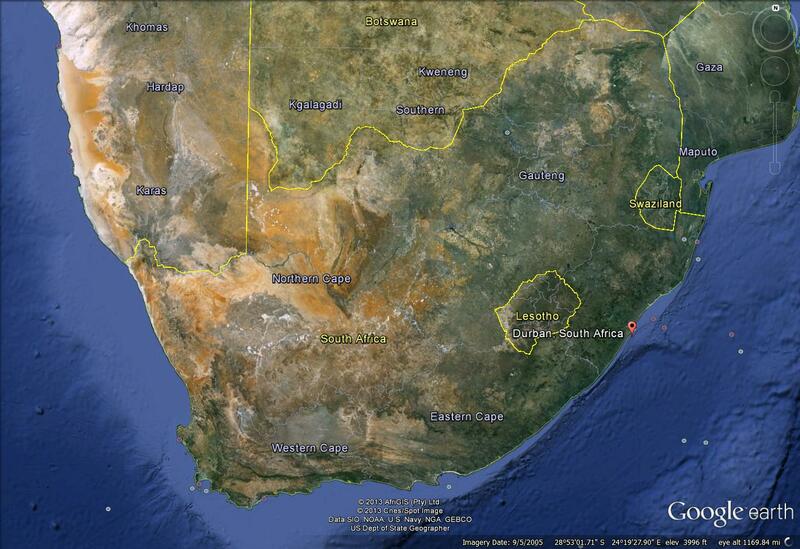 South Africa is home to roughly 50.5 million people (World Bank). The population has been increasing annually especially in urban areas. South Africa’s climate is relatively dry with an average annual rainfall of 464mm which is almost half of that of the average world rainfall (Big Media Publishers). South Africa is not a stranger to conflict as the apartheid ended less than 20 years ago in 1994. Some of the effects of the Apartheid are still felt today and many of the social and environmental problems in South Africa are experienced differently between the racially African South Africans and racially white (Dutch) South Africans. Disparities among the lower and upper class remain as a point of tension in South African society. HIV/AIDS affects a large portion of the population in South Africa and has been an ongoing social and health issue. Like many countries, South Africa has experienced climate change over the past years which have affected many aspects of South African daily life. While some of the effects of climate change remain subtle, many scientists and government officials worry about the future of South Africa in relation to increasing climate change. Many factors including increasing population, patients suffering with HIV/AIDS, economic class relations and water allocation are all tied into the issue of climate change in South Africa. South Africa has seen a decrease in rainfall in recent years as well as an increase in temperature. Between the years 1997- 2006 there was a 6% decrease in rainfall in South Africa (Blignaut 61). At the same time, there has been a 2% increase in temperature (Blignaut 61). Rainfall, which contributes to South Africa’s water supply, has become increasingly infrequent. Moreover, dams in South Africa like the Durban Dams were 20% lower in 2011 than at the start of 2010 (Water Project, Inc.). The change in climate has had an effect on the agriculture sector of South Africa as well as the water supply to urban areas. The change in rainfall hasn’t affected all areas of South Africa evenly so while some areas experience severe water shortage, other areas are anticipating water restrictions in the years to come. The South African government has resorted to the privatization of water in order to combat South Africa’s water shortage problem. In most cities in South Africa, 6,000 liters of ‘free basic’ water are allocated per month, and then a household is charged for any additional water use (IRIN). Currently, the conflict over water privatization remains non-violent with some protests and arrests from time to time. However, the water shortage and water privatization has perpetuated social unrest and the pre-existing tensions in South Africa both racially and socially. For many families in South Africa, 6,000 liters of water per month is not enough and may only last for two weeks at most. With the application of large fees on additional water use, many families cannot afford to pay for more water. Moreover, the consequences of water privatization have had a larger effect on low-income families in South Africa where unemployment and poor living standards are a common problem. Access to clean water is essential for any human being to thrive; however, many South Africans find themselves with little to no water for their families after their allocated supply is depleted. Water shortage has had various negative effects on these communities. Often times, a portion of the water supply itself in cities like Durban is acquired illegally. Moreover, there has been an increase in neighbors stealing water from each other in order to survive. Water conservation efforts by South African families have led to health risks. Reusing their water supply for various household tasks or limiting the amount of toilet flushes per day has increased the risk of water borne diseases. The South African population suffering with HIV/AIDS has especially suffered due to water privatization. HIV/AIDS patients require access to clean water for their care from hygiene to drinking water. Patients suffer from things like frequent diarrhea and soiling themselves so they require larger amounts of water than other South Africans. Even the caretakers are put at a higher risk for infection with the shortage of water since they need a lot of water to keep themselves, their patients and treatment facilities clean. The issues with the water shortage and privatization can be seen as both social and racial. Although the ending of apartheid has improved conditions for ethnically African South Africans especially in relation to access to water and other human rights, tensions between white and black South Africans remain. Socially, the families from low-income homes are enormously affected by the added costs of water through water privatization. While limited access to clean water has become a central issue in the daily lives of these people, water access for the upper-class remains cheap through subsidies. Moreover, the population effected by HIV/AIDS that is greatly affected by the increased water costs has a greater percentage of African South Africans rather than white. In 2008, a study estimated that there was a 13.6% HIV prevalence in the African population compared to a 0.3% HIV prevalence in the white South African population (AVERT). Social movements have begun to form in South Africa in response to the hardships faced by many South Africans due to water privatization. The effects of the water shortage in South Africa can be felt in many areas in society and daily life. There are many factors to blame for the current conflict in South Africa. While the conflict over the water shortage remains non-violent for the time being, potential for the emergence of violence is very real. Apartheid in South Africa is still fresh in the memories of many South Africans faced with the suffering caused by the water shortage in South Africa. The large disparity between the economically lower and upper class South Africans affected by water privatization is also a point of tension. The fact that the HIV/AIDS population affected by limited water access is ethnically African is also puts a strain on African and white South African relations. While the main actor responsible for water privatization is the South African government, climate change, water scarcity and an increased demand in South Africa are root causes in this government policy. The South African government is faced with growing opposition to the current water allocation policies as well as a decreasing and deteriorating water supply. Without change, the South African government could be faced with an even bigger problem: violent conflict. The legacy of the apartheid that ended less than twenty years ago, still affects a large majority of the South African population. Race and class relations are still tense in many regions in South Africa. During the apartheid in South Africa, millions of black South Africans and rural South Africans were not provided with adequate water supply. At the end of the apartheid in the late 1990’s, the ANC South African government enacted progressive legislation to expand water access to the millions of South Africans who were living without. The Water Services Act was enacted in 1997 and the National Water Act was enacted in 1998. While the new legislation has yielded much success over the years by providing water to millions of South African who did not have readily available access, the legislation also contained conservation measures which have severely harmed the health and well-being of many low-income or unemployed South Africans. The Water Services Act and National Water Act have two major features; the first is South African’s right to enough water to meet their basic needs and their right to “an environment sufficiently protected by legislative and other measures to secure socioeconomic development that is also ecologically sustainable" (Funke 16). As a result of the policies, the South African government severely decreased subsidies and grants to local municipalities and supported the creation of financial instruments for privatized delivery. Before the two pieces of legislation, water supply management was abysmal and conservation efforts were few or never enforced. With the National Water Act, the government installed water meters in South African households. Households are granted 6,000 liters of water per month for free, then excess water usage is measured and charged for. The new water policy was implemented to reduce water waste and over-all consumption. The problem with the new policy, however, is that previously these households were paying a flat fee of 110 Rand ($15 USD) per month (IRIN). After the allotted ‘free’ liters of water were used, households with low-income in largely rural communities are faced with large fees for water usage. Moreover, the culture of nonpayment in South Africa is very strong. During the apartheid failure of payment went unnoticed and without consequences. However, between the enforcement of the water meters and 2005, over ten million poor South Africans have their water services cut-off due to failure of payment (McKinley). However, the reality is for most of these households is that they simply cannot afford to make these large payments. While the allotted 6,000 liters of water per month was deemed efficient by the South African government, for many South African households this amount is barely enough. The World Health Organization estimated that an average South African household size of eight people would need at least 24,000 liters per month (McKinley). For many, the allotted water may only last for the first two weeks. Once the allotted water is used, many South Africans must wait until the next month for fresh, clean water. Many South Africans, especially in rural communities, rely on agriculture as a means for income and food supply. In rural communities many residents have gardens that they use for food and nutrition. The limits put on water supply have put a strain on households who use water for small scale irrigation or for raising animals for non-commercial use. As population grew and urban cities demanded more water, Dam projects cropped up throughout rural South African landscape. For the city of Durban, the Umngeni River was harnessed for the creation of the Inanda dam, which became a main source of water supply for the city of Durban and surrounding areas. Residents of rural communities who lived along the Umngeni River and lived off of the plentiful water resource for sustenance could no longer rely on the water source. Restrictions were placed on fishing and there was no longer enough water for gardens and livestock (The Struggle for Water). What was once a bountiful, free resource for this community became a degraded and expensive commodity due to development and new water policy. Previous to new water conservation policies in post-apartheid South Africa, South Africans received water as a public good (if they had a faucet – millions of South African did not) with unlimited access to water at a flat monthly fee. After the National Water Act of 1998 and Water Services Act of 1997 South Africans were expected to pay a lot more for the water they used after the allotted 6,000 liters ran out. However, the reality for most low-income households is that they simply cannot afford to pay the extra water bills. Millions of households have had their water supply cut-off since the start of the policies. Limited access to water has had grave health consequences from waterborne diseases to the inability to provide proper care for HIV/AIDS patients. The change in policy has disrupted the lives of many South Africans entirely. When South Africans are unable to pay for more water they are forced to resort to a number of different options. Many South Africans must conserve their water usage strictly. While the government’s policy and new water meter system was aimed at increased water conservation, South Africans are forced to reuse water causing major public health concerns. To conserve the allotted water as much as possible, South Africans are forced to reuse water for bathing, cooking, washing and performing other household activities. However, reusing this water put South Africans at risk for contracting waterborne diseases. After their household water supply is used, many South Africans resort to getting water from local sources such as rivers, streams and ponds. In 2000-2001, these practices led to South Africa’s biggest cholera outbreak occurred in the province of KwaZulu-Natal (Bakker 155). As a result, over 300 people died and over on hundred thousand people were infected (McKinley). ANC Water and Forestry Minister Ronnie Kasrils acknowledged that the outbreak would not have occurred if free water had been available, noting that poor people simply cannot pay for the services (Mason). Water borne diseases continue to threaten the water sources of South Africa as the ANC government fails to change policy. The limited access to water has also had a major effect on the South African population infected with HIV/AIDS. HIV prevalence rate is estimated at 11% in South Africa (Bakker 154). In the KwaZulu-Natal province, the prevalence percent is the highest at 15.8 (AVERT). The prevalence rate is not evenly distributed throughout the country according to race, either. In 2008, the African population in South Africa had a 13.6% prevalence of HIV compared to a mere 0.3% HIV prevalence for the white population (AVERT). Much of the HIV/AIDS infected population lives in poverty. Therefore, the HIV/AIDS struggle in South Africa remains a race and class issue. Water is vital for the basic medical care and health of people living with HIV/AIDS. The prevalence of HIV/AIDS has been an enormous health issue in South Africa since before the end of apartheid. However, during the time of the apartheid people had access to an unlimited amount of water and therefore medical care for HIV/AIDS infected people was manageable from a water supply standpoint. With the new policies however, both HIV/AIDS patients and caretakers’ lives are jeopardized at the hands of the government. HIV/AIDS patients require extra water for drinking and bathing. Patients need to drink more water due to frequent bouts of diarrhea as well as bath frequently to avoid skin infections. Additional water is used for taking medication and for making foods easier to eat since many people living with HIV/AIDS suffer from mouth ulcers. In later stages of the disease, patients use toilets more frequently and soil their clothes often so flushing toilets and washing clothes because imperative. With the increase in cost of water supply, families and caretakers who take care of people living with HIV/AIDS struggle to provide adequate care. Water conservation policies also put HIV/AIDS patient caretakers and household members at risk. Water is crucial for a clean environment in patient care both for the patient and their surroundings. Dirty water, clothing or household surfaces can pose as serious risks for those in contact with these items. Many households with a HIV/AIDS have reported running out of the free supply of water after only six days (IRIN). After that, many households are forced to hire someone with a van to bring water from wherever they can successfully beg for it or even steal from a neighbor (IRIN). The time period for this case is post-apartheid to present day. Although some historical context from the days of apartheid needs to be explained in order to understand the current situation, the focus will remain within the past twenty years. Social tensions and protests are currently the only forms of conflict which have been prevalent throughout this entire period. The location of the case study is South Africa. There is an increased focus on the region of KwaZulu-Natal where the city of Durban as well as rural areas are found. The Inanda dam is located in this region. The dam is the main source of water supply for the city of Durban and surrounding regions. South Africa is a relatively dry climate. The average annual rainfall of 464mm is almost half of that of the average world rainfall (Big Media Publishers). The annual dam level has decreased since 2010 and higher temperatures have caused increased evaporation of water resources in South Africa. 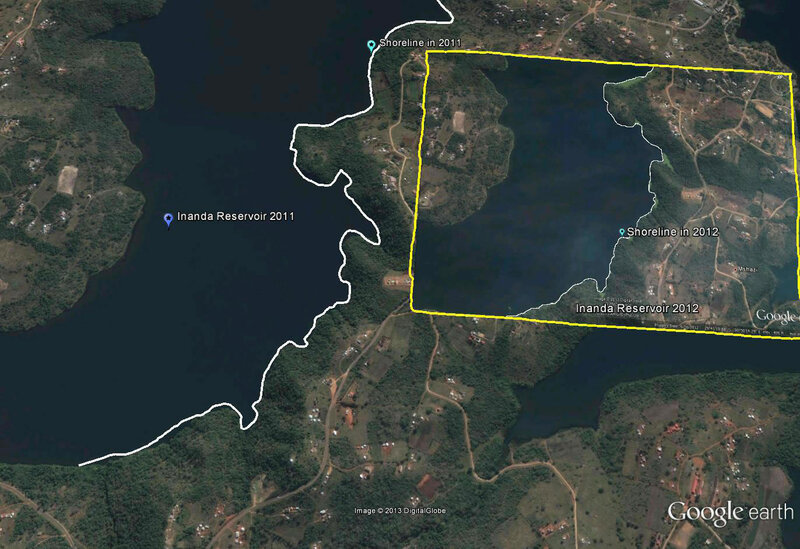 The Inanda Dam is unable to sustain the KwaZulu-Natal region’s carrying capacity. The actors involved are mainly the ANC South Africa government and low-income South Africans that have suffered from water shortage issues. The low-income South African demographic consists of mainly black South Africans. Large family households as well as HIV/AIDS infected South Africans are also a large part of this group. South Africa’s climate is relatively dry and the average rainfall is nearly half of the world average at 464 mm per year (Big Media Publishers). South Africa relies heavily on rainfall and water supply in dams and rivers as a source for water. An increasing demand for water due to increasing population and poor water resource management has left South Africa vulnerable to the effects of climate change. Like many other African countries, South Africa has experienced climate change within recent decades. Over the past half century, South African climate has experience a small, but notable increase in temperature. South Africa overall has seen a 2% rise in average temperature (Blignaut 61). KwaZulu-Natal has seen a 2.1% temperature increase (Blignaut 61). While this slight rise in temperature may seem insignificant, even a 1 degree rise in temperature can have tremendous effects on a region’s climate. Increase in temperature leads to increase in water evaporation, decline in quality of surface and groundwater, overall drying and plant stress. Another element of climate change that has been observed is a decrease in rainfall by 6% in the past decades overall in South Africa (Blignaut 61). For the KwaZulu-Natal region there has been a 5.8% decrease in rainfall (Blignaut). Moreover, studies have shown a decrease in intense weather events, but an increase in extreme weather intensity throughout South Africa most likely correlated with the increase in temperature. All of these recent trends have grave implications for South Africa’s water supply. Even a slight increase in temperature can cause a significant increase in water evaporation. Naturally, precipitation refreshes the water supply, but as annual rainfall follows a declining trend, supplies diminish. Moreover, an increased inundation in extreme weather events does not prove to be useful for water supply replenishment. Since the time between these events has increased, dry spells are able to last longer which increases overall drying. The instability of water supply is a poignant issue in South Africa. Before the National Water Act, enacted in 1998, water consumption was grossly unmanaged. Even still, a few years after progressive conservation legislation, in 2000 it was estimated that South Africa used nearly all of their total reliable surface water supply – only 1.4% of water was unallocated (Blignaut 61). Increase in temperature and infrequent rain fall has led to diminished water supply. Dams in South Africa like the Durban Dams were 20% lower in 2011 than at the start of 2010 (Water Project, Inc.). With a diminishing water supply and inevitable increase of climate change forces, South Africa has been placed under a heavy amount of water stress. South Africa’s climate ranges from a temperate to semi-arid country. KwaZulu-Natal is considered temperate and non-arid. 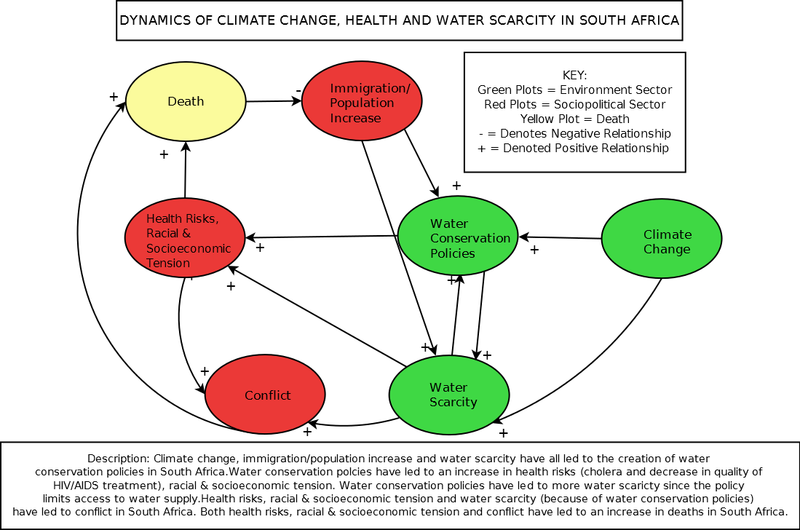 Act: Structural Violence by ways of water policy harms low-income South African households. The conflict in South Africa over water scarcity has yet to break out into a violent conflict; however conditions exist for potential violent conflict in the future if measures aren’t taken. That being said, this issue has fostered spurts of violence throughout the years, which may act as a sign of what is to come. Protests and acts of defiance towards the South African government have taken place throughout South Africa against water privatization. Public protests against water privatization have taken place since 2001 in Johannesburg and townships and continue to take place. In 2002, four protesters were wounded in a struggle against municipal security guards one the city was told that part of the local river in Alexandria were identified as cholera danger zones (Mason). The city was promised cleaner water and improved sanitation after the water supply was privatized by the multinational company Suez-Lyonnaise. Violent acts against water meter installments and the bailiffs who disconnect supplies have been reported. Two disconnection bailiffs were killed after attempting to disconnect the water supply of households in eThekwini (Mason). In some communities, residents destroyed the pre-paid water meters as a blatant act of defiance against water privatization and the South African government. Government officials have responded by arresting and imprisoning hundreds of activists and community members. Many members of the ANC government label the South Africans opposed to water privatization as ‘criminals’ who are perpetuating the ‘culture of non-payment’ (McKinley). The disconnect between the ability of these residents to pay and the willingness to pay persists. This conflict revolves around access to resources (water) and political structures (water supply policy). Due to these two factors, health becomes a driver in this conflict as well. Right now, the conflict is considered ‘potential’ to become a violent conflict, but one could argue that the water privatization policies have indirectly led to fatalities. First, the cholera outbreak in 2000 in KwaZulu-Natal after the water supply was switched to a water meter system resulted in the death of over 300 South Africans. On top of that, over 100,000 people were infected with cholera. Although the new water policies did not cause people to become infected with HIV/AIDS, water privatization has caused increased suffering to these people. In 2011, 270,190 people died from AIDS-related causes (AVERT). Since water is vital to HIV/AIDS patients, life expectancy decreases when water supply decreases. Although water can’t cure HIV/AIDS, it can improve and sustain the lives of those suffering from the virus longer with proper supply. Climate change has heightened water scarcity in South Africa. Higher temperatures and erratic rainfall has weakened water supply in South Africa’s water resources like the Inanda Dam. Climate change predictions for the future – which forecast that temperatures and extreme weather events will increase and rainfall may decrease – have prompted the ANC South African government to implement water conservation policies like the Water Services Act and the National Water Act. These policies have had a massive effect on the well-being of low-income South Africans, many living in rural communities. The balance of water conservation and granting affordable access to water for millions of poor South Africans has yet to be realized. Through these policies, the South African government has increased water access to millions of South Africans in rural communities who did not previously have the infrastructure to gain access to water through faucets and pipes. While this part of legislation has benefitted the millions South Africans who previously had little to no easy access to water in the first place, costs have gone up for water overall. The Water Services Act and National Water Act’s two major features, the right to enough water for basic needs and the government’s duty to maintain a sustainable environment for the future have been incompatible in many ways. As a result of the policies, the South African government severely decreased subsidies and grants to local municipalities and supported the creation of financial instruments for privatized delivery. Climate change predictions for South Africa have been grim and the government has taken notice as they have already been feeling the effects the climate change. By 2050, South Africa could see a climb in temperature by about 1oC along the coast and up to 3oC in the interior (Joubert 62). By 2100, predictions show that the Western Cape could see rainfall drop by as much as 25% and experience an increase in severe floods (Joubert 62). The effect the temperature increases will have on water reserves will be observed in agriculture, natural landscapes and water availability for consumption in both rural and urban communities. Evaporation is projected to increase by 5-10% by 2050 and could rise to as much as 25% by 2100 and soil quality will continue to degrade (Joubert 62). In 2000, the annual surplus of water supply after national consumption was only 1.4% (Blignaut). This is an illustration of the scarcity of water supply in South Africa. Should demand grow or supply increase – due to climate change – South Africa could enter into a national water crisis. In previous apartheid days, residents who did have access to a faucet and pipes had an unlimited supply of water at a flat rate per month. This policy, although beneficial to South African residents’ needs, was not environmentally sustainable. Climate change predictions and assessment of water usage and supply have been the driving force for these conservation policies. How Does This Affect the People of South Africa? There is no doubt from a statistical stand-point that South Africa needs to take drastic steps to conserve their water supply as well as amend management policies to address the effects of climate change. However, these policies have harmed the livelihoods of millions of low-income South Africans. The Water Services Act and the National Water Act have expanded water access to millions more South Africans who previously had to travel far distances to get water or lacked adequate water resources and sanitation. However, residents in rural areas who gained water supply infrastructure still struggle to meet payments which results in water supply – and very often electricity supply – disconnections. Moreover, more water for more people means less water for everyone overall due to the conservation policies and reality of South Africa’s water supply. The result of these policies were after the allotted 6,000 liters of free water supply was depleted – which for many households of over 6 was within two weeks – residents were forced to pay extra for the water they used. While this is a reasonable request for those who can afford it for the sake of conservation and environmental sustainability, the reality is that most of these low-income households simply cannot afford the new price hikes. In many communities, the cost increases ranged from 55% to 600% for water supply (McKinley). Moreover, unemployment in many South African communities is a huge problem with some townships with an unemployment rate of 40% (McKinley). Some of these townships saw their water costs increased by 69% (McKinley). Quality of life has diminished for many due to decreased access to water, especially for those infected with HIV/AIDS which totals nearly 11 percent of South Africa’s population (Bakker 154). Major outbreaks of cholera have resulted from the water policies which have led to hundreds of deaths and thousands infected throughout South Africa due to poor sanitation and consumption of water from local streams and ponds. Failure of payment by residents has led to millions of people being disconnected from their water supply as well as electricity (Bakker 153). These problems have not been felt on an equal scale in South Africa. The policies have placed harm on poor households who cannot afford the added cost of water. Many of these communities are majority black South African communities. Moreover, the people living with HIV/AIDS who feel the effects of the water policies are also mostly black South Africans with a prevalence rate 13.6% for their population group as opposed to white South Africans with a prevalence rate of 0.3% in their population group (AVERT). Therefore, the issue of water supply is largely felt as a race and class issue which perpetuates the apartheid legacy and strengthens race and class tensions. The ANC South African government implemented the two water policies in the post-apartheid 1990s to address the inequalities of access to mainly rural, black South Africans. However, these policies only furthered social unrest with the South African government. Without change, the situation only seems to have the potential to worsen. With increased climate change, water access and availability will continue to decrease. Water quality will worsen due to sanitation problems and consumption of water from streams and ponds. There will be increased cases of cholera outbreak if the problem persists. Care for HIV/AIDS patients will continue to deteriorate and overall health of residents will decline due to lack of clean water. Protests will increase, acts of defiance against the government will increase and tensions will heighten. If the trajectory of climate change and water scarcity continues without change in policy or management, the potential for violent conflict is substantial. While this conflict remains nonviolent, many actors recognize the seriousness of the situation. The government maintains that the water conservation and privatization policies are necessary for the sustainability of South Africa’s future and has been praised for its progressive actions to conserve water. Moreover, the government has been successful in supply millions more South Africans in rural areas with water (although many cannot afford it passed the allotted amount). However, water supply to more South Africans mean less water for everyone overall when conservation policies are in place, therefore the suffering of millions of low-income South Africans have been prevalent. As a result, social movements on the part of the community and NGOs from within South Africa as well as abroad have devoted themselves to this cause. The Coalition Against Water Privatization (CAWP) and the Anti Privatization Forum (APF) both formed in the early 2000’s have devoted their time and efforts to turn the tide against water privatization. Bakker, K. J. (2010). Privatizing water: governance failure and the world's urban water crisis. Ithaca, N.Y.: Cornell University Press. Blignaut, J., Ueckermann, L., & Aronson, J. (2009). Agriculture production's sensitivity to changes in climate in South Africa. South African Journal Of Science, 105(1/2), 61-68. Joubert, L. (2011). South Africa's Changing Climate. Current Allergy & Clinical Immunology, 24, 62-64. Loftus, A. (2012). Everyday environmentalism: creating an urban political ecology. Minneapolis: University of Minnesota Press.